March 20, 2019 - The Capital Needs Steering Committee met last night at the AISD Professional Development Center to continue reviewing and prioritizing the AISD’s capital needs. The committee first received a presentation from a member of the AISD’s Financial Futures Committee (FFC). 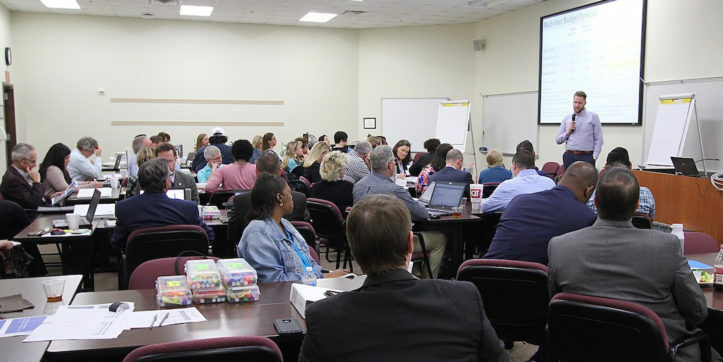 The presentation reviewed the district’s financial status, its sources of revenue and its projected future, and then concluded with the FFC’s recommendation for a Tax Ratification Election (TRE). Following the financial presentation, David Sturtz, consultant with Cooperative Strategies, presented a list of district capital needs for the elementary, junior high and high school levels, along with needs for support facilities, technology and security, and fine arts. The list had been developed using input from the CNSC’s subcommittees, community dialogue meetings held in February, a community survey, a two-day options development meeting with AISD administrators, and a districtwide capital needs assessment. CNSC members then had time to discuss the list of needs in small groups and offer feedback. The committee will continue to review the options and offer feedback at its next meeting on April 2.